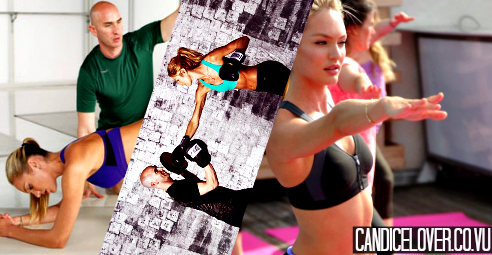 ++ CANDICE LOVER ::: Exclusive interview w/ Candice's personal trainer, Justin Gelband! Exclusive interview w/ Candice's personal trainer, Justin Gelband! To have a body like Candice, it's like a dream for everyone. we wanted to do something like a short interview with Candice's personal trainer, JUSTIN GELBAND who is such a sweet person who gives various models' fans interviews and answers questions. We want to tell you he follows us on Twitter, too! Click read more button to continue reading interview and seeing pictures. First question: For about how many hours does Candice work out? Should she not workout with me she is always doing something active! After training for so long and building her a foundation for her body, she can use her body to stay lean, fit, and toned without having to actually train! Her background of 12 years of ballet combined with our specific training of the smaller muscle groups has given her the advantage of having the best body in the world! Work in itself is a workout and she uses it as one! As far as our workouts when she is in town we train 2 to 4 days a week and 4 to 5 a month before the show! Her traveling and schedule is very full so she does do a lot on her own and we also skype! Second question: Is Candice a hard worker for you? Candice is a hard worker for herself most of all! She really puts 150 percent into her work and workouts! For me she is a professional athlete that invests whatever it takes to be the best she can be with the body she has been given! > mean, she has easily getting fat or always-being-skinny body? Candice has a background of BAllet which she did for 12 years! Since she began at such a young age weight for her is super easy to lose! Everyone has this image that candice may not eat or take good care of herself cause she sometimes looks on the skinnier side! This girl eats and eats very well! She takes great care of herself just there are times that she is working 7 out of 7 days and sometimes loses weight cause she doesn't have enough time to put in the same time other people may have to keep the weight on! These girls work their asses off but they all eat at least the ones that train with me! Sometimes its just hard when you are working, traveling, working traveling and working! Sometimes doesn't give you the proper time to eat the way you want to but this girl eats just burns through it with her super metabolism that she has! With the way I train that together we could accomplish all that she has accomplished until today! She is amazing, she is family and she is someone that will always be a huge part of my life and what we do together as a team is what makes our results possible! Thanks to all her fans for being so supportive and know how this girl is hardest worker I've met! She puts it all in and goes for everything! Certainly a woman that women can mentor and learn a lot from! CANDICE ALSO WORKS OUT SO MUCH HARD, WE CAN SHOW YOU HER PERSONAL TRAINER'S AND HER PHOTOS TOGETHER. DO NOT OWN ANY ANSWER FROM THIS IF NOT CREDITING US, OR YOU'LL HAVE PROBLEMS WITH POLICY.